Ah maternity t-shirts. So many lovely ideas on Pinterest for slogans and designs, and yet so few places to buy from. My internet choices were to get something shipped from the US for extortionate prices or settle for a ironed-on cheap knockoff version, that I wouldn’t know the fit of until it arrived. So I did what any sensible crafter would do and decided to design and make my own! First off was to buy some maternity shirts. I found one of the few places to physically sell maternity wear in actual shops you can visit to be Peacocks, and very reasonable prices they were too- I bought two but will no doubt get more as my existing t-shirts stop fitting me! Next was to choose my designs. I opted for “Loading. 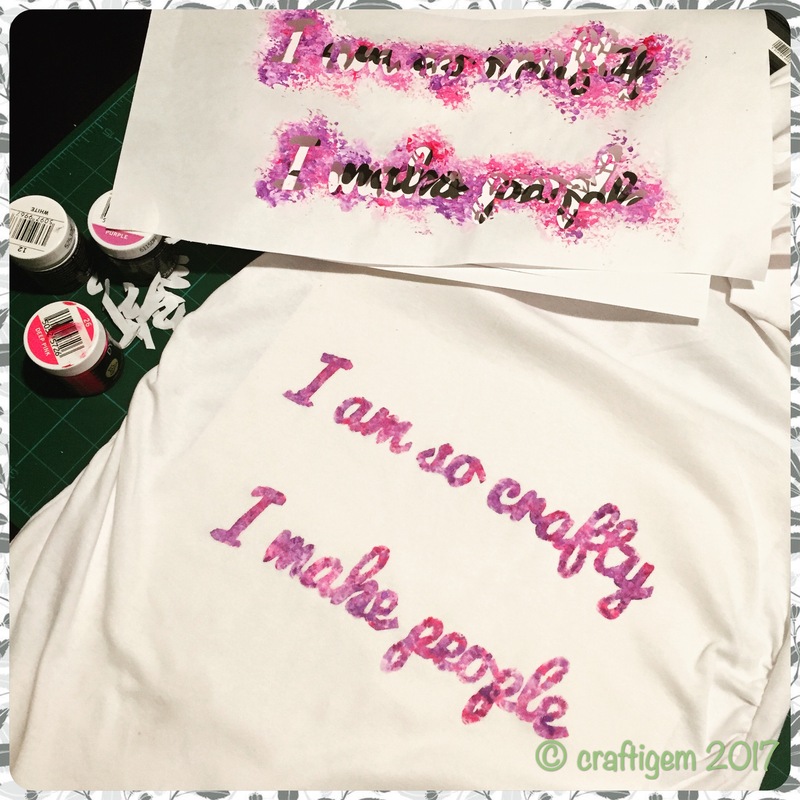 Please wait…” and “I’m so crafty I make people” to reflect both my geeky and crafty sides. “Loading. 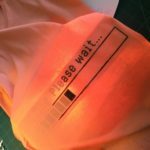 Please Wait…” was the simpler of the two to produce as it involved just a permanent fabric marker pen. 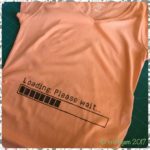 The first step was to stabilise the fabric whilst transferring my design to it wouldn’t get distorted on the stretchy t-shirt fabric. I used a piece of freezer paper ironed on the reverse side of the t-shirt and then attached the print out of the design onto the freezer paper with sellotape. I then used a light box to shine through the paper and t-shirt so I could draw on the fabric with a pen. Once transferred a quick iron with a hot, dry iron to seal in the ink and it’s ready! For the second design I decided to get more crafty and use fabric paints to sponge print on the design and get that mottled, summer effect that you see on a lot of inspirational quote type pins these days. I first chose a suitable font and printed out the right size to fit onto the shirt and then traced this to freezer paper. Using a craft knife I then cut out the letters making sure to keep the inside of a’s etc. attached so they would iron onto the fabric and not affect the printing process. Again I carefully ironed on the freezer paper to keep my lettering intact and then put a piece of cardboard between the front and back of the t-shirt so the fabric paint wouldn’t stain through. I used Dylon fabric paint pots in pink and purple for my design. For the first ‘sponging’ I lightened up the pink and purple separately with white and went over the whole design in a random splodgy pattern. I let that touch try and then sponged on gradually darker versions of the two colours until I achieved the effect and colour I wanted. Again I let this touch dry and then carefully peeled off the freezer paper. I used a small paintbrush to fill in the little lines left by the letter stencil for a’s etc. and left that for a final dry overnight before using a hot dry iron to again press the ink into the fabric and seal it. So the final results: two lovely printed t-shirts to show off the bump! Previous post: Jeans to skirt upcycle- with added maternity benefits!